Recently qualified, Craig’s journey to self employment started with a volunteer role at a local forestry business. 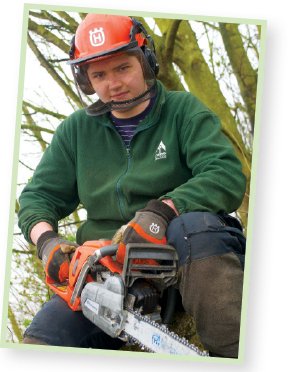 In the end learning based around practical work experience helped Craig succeed and he now has a number of qualifications which help him demonstrate to potential employers and customers that he can work safely using a chainsaw and other equipment with small and large trees. His first contract was on the Dalmeny Estate. He has since been offered work in the Highlands. How does he expect to find his next job? twiggy branches that take a lot of what foresters call “brashing” and hot weather get a mention. But it is clear that working outdoors is a joy for Craig.